In our house, we like to create our own zany reality. Funny enough, nobody would ever suspect just how silly our little family is; to look at us, we’re very straight-laced and socially well-behaved people. But when we’re in the privacy of our home, our own little sanctuary, things are different. So very often, loud cartoon voices punctuate the environment in our home, as do ridiculous, made-up phrases and silly imitations that result in bursts and fits of uncontrollable laughter because of the absolute absurdity of it all. Of course, there’s the potty humor; and then there are the frequent outbreaks of singing, with my husband’s glorious falsetto renditions of old classic tunes from our childhood in the late 70’s and 80’s (those are particularly ridiculous to our teen-age son who’ll usually ask, “What song is that?”). That’s just a little taste of how we like to roll in the privacy of our home. It’s a right madhouse sometimes, and I feel for our neighbors who are undoubtedly exposed to all of this due to thin windowpanes. Sometimes, I’m even slightly embarrassed to make eye-contact the next day, as I don’t know how much of it they’ve heard, but it’s a madhouse in the most amusing and loving way imaginable. We’ve resigned ourselves to the understanding that this is just our unique way of coping with daily stresses; that rather than taking things out on one another from sheer exhaustion at the end of a day, we instead resort to ridiculous characterizations and foolishness to release our pent-up energy. And some of our silliest and fondest memories are the ones we have during our “breakfast for dinner” nights, while wearing our robes. Whenever we have our “breakfast for dinner” night, it’s always on a Saturday evening. The buttery-brown scent fills the kitchen, and by the time he gets down to the last bits of batter, with the last pancake in the hot pan, we’re all ravenous with our tummies rumbling ready to eat. It’s a waiting game, but well worth it. There’s something magical that happens when that sweet, maple syrup spills onto the crispy bacon, or a bite is taken with a little bit of each element, sweet and salty, on the fork. And as fun and cozy as our “pancakes ‘n bacon” dinners are, they also can be a bit time consuming because of the prep of making everything from scratch, and timing it all just right so that everything is piping hot and fresh off the pan; plus, it’s difficult to enjoy them in the middle of the week when we’re all running around. So, with it being the fall and all, and with maple being a perfectly wonderful fall flavor, I thought it time to turn on my oven and start baking some COOKIES! And these little babies were the first ones I wanted to have my hand at trying, so that we could enjoy the flavors of our beloved “breakfast for dinner” fare in a little sweet-savory snack, anytime. Just put your face in front of a plate of these, close your eyes, and take a deep breath in—you’ll think what you’re smelling is a plate of buttery, maple-y pancakes with bacon, no joke. I’m a firm believer that a family needs some real absurdity in their home. God knows we’ve collected some great memories, some of our fondest memories, during bursts of silliness. There are funny phrases and foolish displays that we still reminisce over, that my husband and I know our son will always have with him, and possibly even pass on to his own family some day. Laughter and joy in a household is the best antidote for all of the seriousness of life, and having our “breakfast for dinner” nights, or at least some Pancakes ‘n’ Bacon Cookies to tie us over in the middle of our week is indeed a delicious way for the cookie of life to crumble. -In a small/medium-size bowl, add the flour, the baking soda and the baking powder, and gently whisk to combine (these are the “dry” ingredients); set aside for a moment. -In the bowl of a standing mixer fitted with a paddle attachment, add the softened butter and the sugars, and cream together for on medium speed until light and fluffy; next, add in the whisked egg, the maple flavor and the real maple syrup, and continue to cream for another moment until combined; turn the mixer down to a lower speed, and begin adding the “dry” ingredients in increments, until they get incorporated with the creamed butter/sugar/egg mixture; once all “dry” ingredients are added and combined (be careful not to overwork the batter), add in the buttermilk until combined, and turn off the mixer. -Next, divide the cookie dough in half (roughly) in the bowl with a spatula; place a large piece of plastic wrap on your work surface, and turn half of the cookie dough out onto the plastic wrap, and gently shape it with your hands into a log shape, about 12” long, not too thick or too thin; wrap the plastic around it, twist the ends to secure, and place the cookie dough log into the freezer to firm for at least 45 minutes, or more, if you want to freeze the dough; repeat the process with the other half of the cookie dough. –To Bake: Preheat the oven to 350 degrees, and line a baking sheet with parchment paper; slice the chilled/firmed cookie dough log into ½” thick slices (cookies); place the cookie dough slices onto the lined baking sheet, and bake the cookies for roughly 10 minutes, until soft and chewy, but slightly golden. 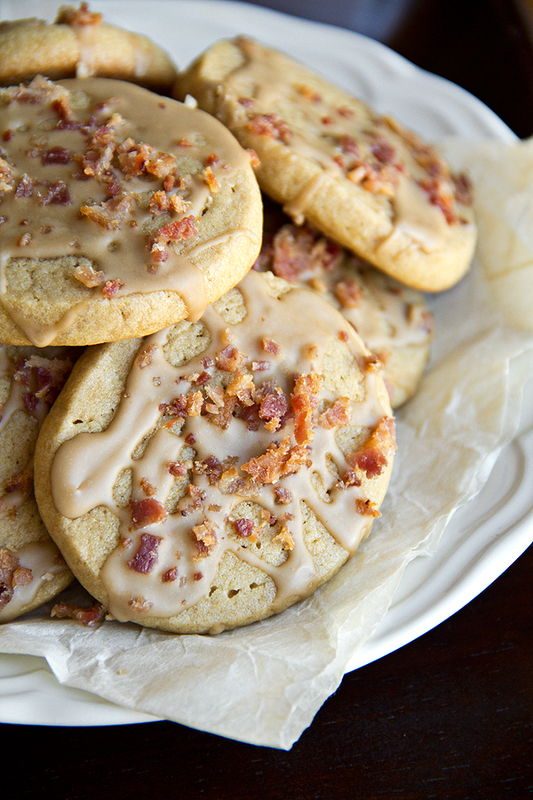 -Once the cookies are cooled completely, drizzle them generously with the Maple Glaze, and then immediately with a little sprinkling of the crispy, chopped bacon so that it adheres to the glaze on the cookies. -In a small bowl, add all ingredients and whisk together until smooth (the glaze should be thin enough to drizzle, but thick enough to adhere well to the cookies and not get absorbed by them); drizzle the glaze over completely cooled cookies, and allow it to set for about 20-30 minutes. Very sweet of you—thank you. 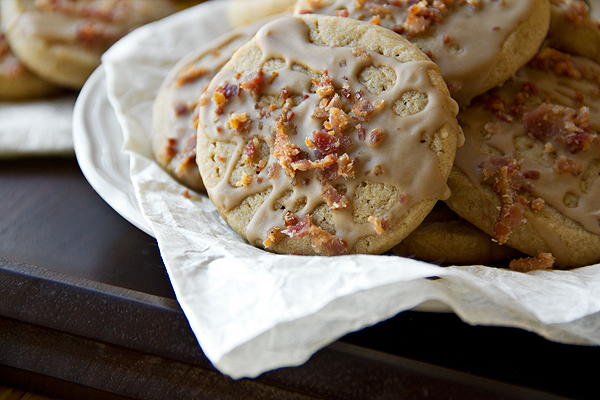 What an interesting concept – bacon on cookies! That would be a great comfort food breakfast! This is genuinely unique. Good job! 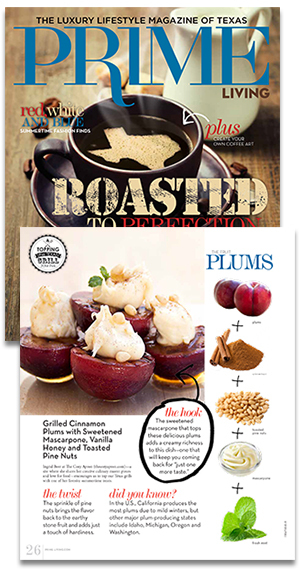 I would love to try this recipe, but exactly what is maple sugar? Hi Sue, thanks for your question! Maple sugar is made from the sap of the sugar maple tree, so it’s essentially sugar made from a maple tree. I purchased mine at my local Trader Joe’s, but if you don’t have one near you, you can probably find maple sugar at Whole Foods Market, or a health food/specialty-type store. If you can’t find it, try substituting an additional 1/4 cup brown sugar and 1/4 cup regular sugar instead, and 1 1/2 teaspoon maple flavor. Hope that helps! Such a great idea & combination of flavors. Well done! 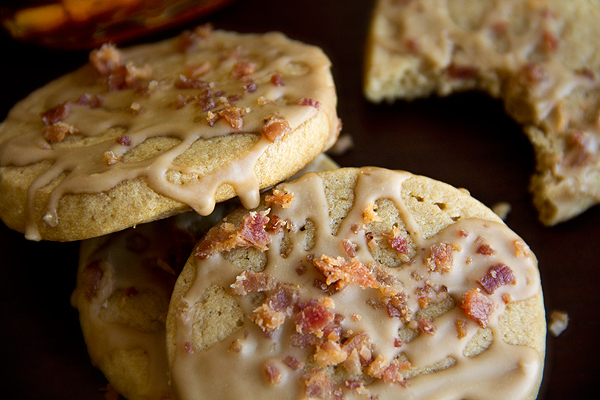 Love the idea of these cookies and can not wait to make them! If there are any left over do I need to refrigerate them because of the bacon? Hi Denise, no you don’t; the sugar in the cookies, plus the fact that you’re dealing with cooked, cured bacon (a small amount, really) makes them just fine at room temp for as long as they stay soft & fresh! Hope you enjoy. Hi! I was wondering when to incorporate the buttermilk. I’m making these for my daughter’s book report project (long story, but it’s a book about a horse and somehow pancakes and bacon ties into the story) and I’m using a horse head shaped cookie cutter. Would these do well if rolled out and cut with a cookie cutter? Also, I don’t have a paddle standing mixer- could I mix by hand and get the same result? Hi Ashley, how fun that you’re making these as part of your daughters book report project! (The kids’ll thank you for the cookies! 🙂 ) So, I’d say this: you should be fine rolling out the dough and then using the cookie-cutters to cut out the shapes, just don’t roll it too thin; maybe leave it the 1/2″ thickness, as suggested above. The only concern I have is that you don’t have the electric standing mixer—of course you can make this by hand, but as far as getting the exact same result, I can’t say for sure. A hand never has quite the “creaming” power as a machine, but just get things incorporated and creamed as best as you possibly can, and then I think you should do pretty well. (I think that they’ll still taste amazing! They’re cookies, after all!) 🙂 Hope you have fun!! 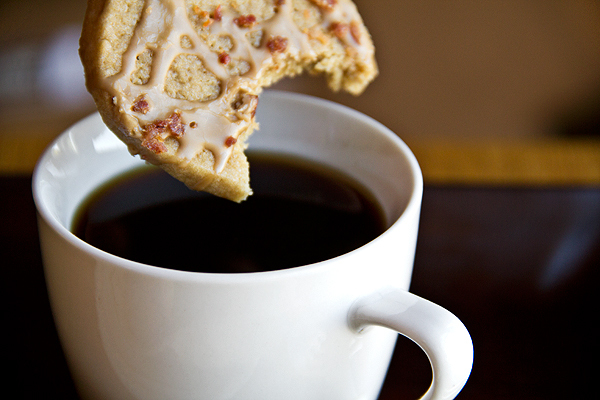 These are just the cookies everyone wants..breakfast energy all day long! 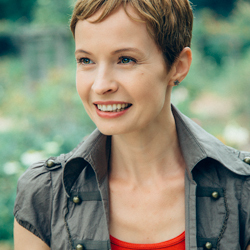 I just found you today….so glad that I did, Ingrid. You have a wonderful way with words….i enjoyed your “company” as well as several recipes. Thank you. Judy, thank you so much for sharing your comments with me; it touched me very much that you enjoyed not only the recipes, but the “company”, as well! That’s always my hope. 😉 I appreciate you stopping by our little “home on the web”, and hope you visit (and enjoy the recipes!) often! Hi Ingrid..Please help! 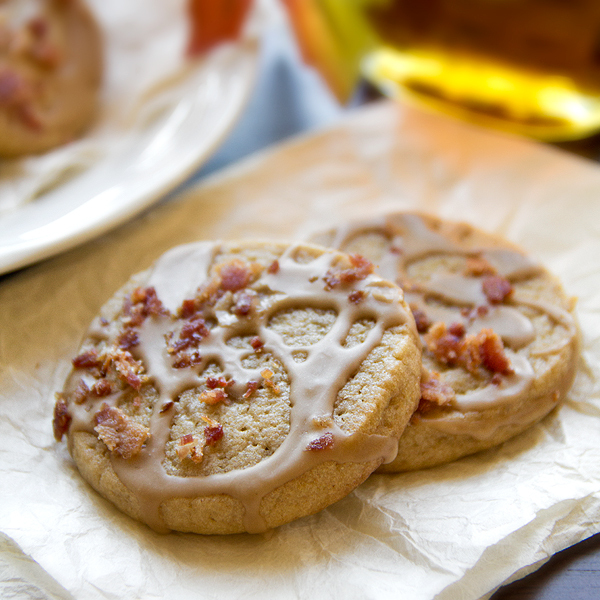 I’ve got all my ingredients coming to room to temp to make these cookies, and I’ve read through the steps, but I see where there’s only enough bacon and glaze for 12 cookies! The recipe yield is 40+ cookies! Why is this..am I missing something? How much bacon and glaze should be made for the entire recipe? Is there some way to make a larger-sized (diameter) cookie? Also, I’d like to know if these spread out much? Hi Marie, you’re not missing anything—the glaze recipe is for 12, not for the whole batch. I often find that folks like to make around a dozen or so cookies, in order to enjoy them fresh; and they freeze the rest of the dough for later use. And so I tailored the glaze recipe towards that. That way, if one would like to make more (the whole batch), one would just multiply the glaze ingredients according to how many they wanted to bake off. In your case, since you’re wanting to bake the entire batch, you’d do about 3 or 4 times the ingredients. 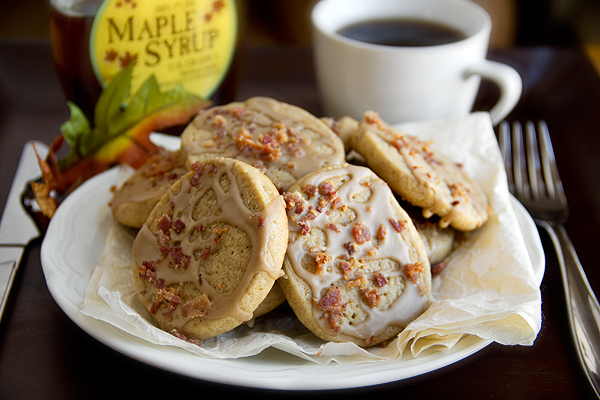 (2 cups powdered sugar; 1 teaspoon maple flavor; 2-4 tablespoons water…and about 6-8 strips of bacon.) Hope that helps! I made these today for a cookie exchange at work tomorrow. They are amazing and my family loves them. I can’t wait to hear what my co-workers have to say about them. Tricia, I’m so happy to read that! So glad you enjoyed them, and I hope your co-workers did, too!